2019 has been a tough spring. We had one greenhouse that was a victim of the flooding in March. 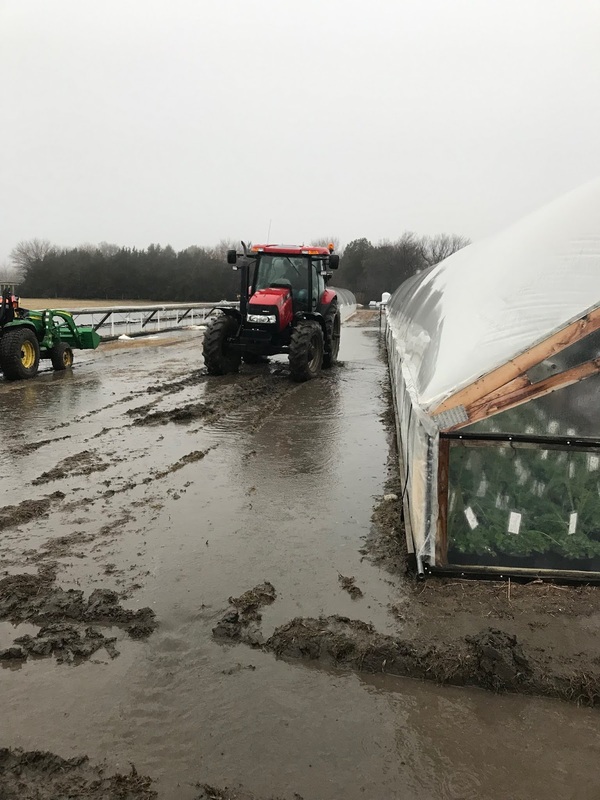 This greenhouse was built seven years ago and we did some work with a transit and grading to assure the water would run away from the building during a typical rain. What we had in March wasn't rain and definitely wasn't typical. We have a four acre alfalfa field to the south of this greenhouse and when the snow melted and the rain came there was simply no place for it to go. As the ground was frozen and could not penetrate the alfalfa field, it started heading north and one bay of this building was in the way. We had approximately 1000 bump up pots that sat in water for a very short time. We hung them as fast as we could in every place we could possible hang a pot. When the water drained, I placed a call to my Ball Horticulture rep and asked him to find the best horticulturalist he knew and ask what the best systemic fungicide was to use in this situation. We ordered it and applied as quickly as we could. We had little to no damage from the flooding. I believe we were lucky the flooding happened when it did. Mature plants can take more abuse than young plants. I believe if this flood would have occurred two weeks earlier we would have lost plants. Interestingly enough, we learned that succulents love flood water. A few days after the flooding, we had some succulent bowls that absolutely looked spectacular. I checked this building at 5:00 am and there was no water in it. At 8:00 am the building was flooded. It was amazing how fast things can change. The wind will blow today but the one thing we do have at Open Air Nursery is great wind protection. Our fence and structures really make it nice to shop for the customer on a windy day. However when you leave the front gate and enter the parking log, grab your hat and hang on. We will run regular hours from 9:00 am to 7:00 pm. Next week will be a better week for me personally as my wife will be back from Minnesota's dance competition. You don't realize how much you need and miss your business partner until she leaves for four days. Please come home Kelli and Breanna!!!!!! The rain in the forecast tomorrow will not change our hours. If you plan to shop the nursery in Shelton, maybe bring an umbrella. The Aurora store is stocked with bump up pots, a bunch of succulents, and a bunch of 2.5 quart mixed combos. We also have moved broccoli, cabbage, and cauliflower to the Aurora store.